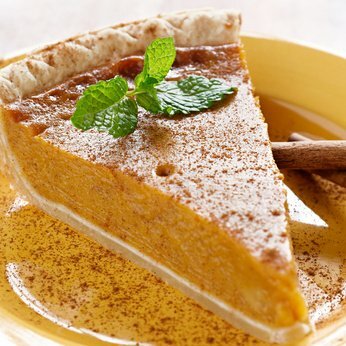 When I go to the grocery store, my day is made when they are offering 5 ounce slices of pumpkin pie for sale. I like pumpkin pie and I fool myself into believing that I'm really eating a nutrient rich health food as I eat my slice of goodness in the parking lot. It's an easy argument when you consider that pumpkin is a superfood, especially when you forget about the sugars and other ingredients that aren't superfoods. When I first saw TV programs on "Punkin Chunkin," the sport of shooting or flinging pumpkins, I felt uneasy about the wasted food, but my fears were slightly assuaged when I saw that serious contestants usually make arrangements with farmers to grow gourds that are based more on their aerodynamics rather than their phytochemical content. Pumpkin is low in calories, but high in fiber and nutrients like potassium, pantothenic acid, magnesium, and vitamins C and E and it enables vitamin A. Pumpkin with its golden-orange color is a carotenoid. The Linus Pauling Institute explains about carotenoids, "Carotenoids are a class of more than 600 naturally occurring pigments synthesized by plants, algae, and photosynthetic bacteria. These richly colored molecules are the sources of the yellow, orange, and red colors of many plants. 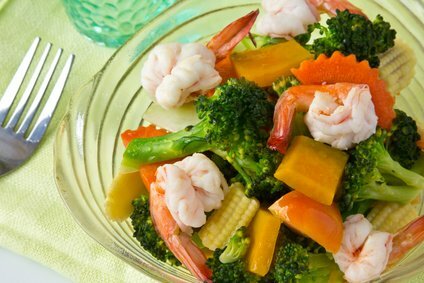 Fruits and vegetables provide most of the carotenoids in the human diet. Alpha-carotene, beta-carotene, beta-cryptoxanthin, lutein, lycopene, and zeaxanthin are the most common dietary carotenoids. Alpha-carotene, beta-carotene and beta-cryptoxanthin are provitamin A carotenoids, meaning they can be converted by the body to retinol." LPI also reveals that "Vitamin A is a generic term for a large number of related compounds. Retinol (an alcohol) and retinal (an aldehyde) are often referred to as preformed vitamin A." Carotenoids don't just work by themselves. Cooking and proper prep work together improve nature's gift. For example, eating a chunk of pumpkin is not as beneficial as cooking the pieces of the gourd with a healthy oil. 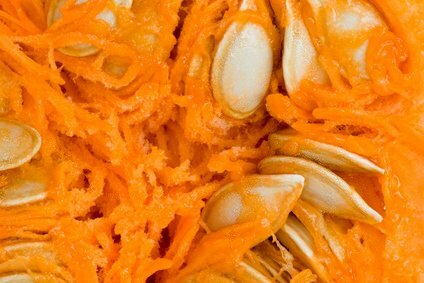 This generally increases the bioavailability of the carotenoids in the squash. Cans of prepared pumpkin, usually more prevalent on the grocery shelves in the fall, are a good way to have the superfood around. Canned pumpkin can be used in a variety of dishes to make them more nutritious and to reduce calories. 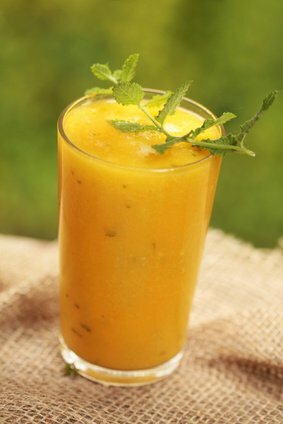 You could use a couple large tablespoons of pumpkin mixed with yogurt to make a healthful smoothie. For a dessert, try a yellow, spice, or chocolate cake mix combined with pumpkin for added flavors. The pumpkin replaces the oil and eggs. Peg's favorite is a spice cake mix with the warming autumnal spices added, like cinnamon, nutmeg or cloves; and, of course, toasted, chopped walnuts or almonds. A favorite in our household are the prepared pouches of brown rice, wild rice and quinoa. 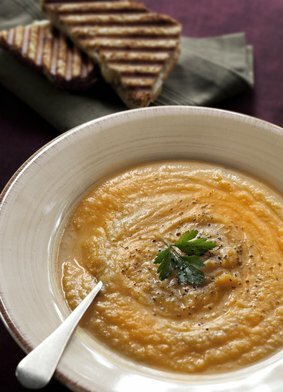 A dollop of pumpkin mixed into the steaming bag and an extra 15 seconds in the microwave produces a flavorful side dish. Most people just throw away pumpkin seeds when they're carving their Halloween jack-o-lanterns, but they are a great food by themselves. They're a lot of work to prepare, but they are tasty and, according to the Massachusetts Experimental Station, they increase their protein over time when stored. Archaeologists have found pumpkin seeds in Mexican caves that date back nine thousand years. But I doubt they were still increasing in protein. Pumpkin seeds or "pepitas" are widely used in Mexican food. Many mixed nut offerings now contain them as well. You can even buy pumpkin seeds on Amazon. Some people recommend a pesto made of pepitas, lime and basil, and that sounds really good. I've got to try that. Here's a recommendation for a tasty, healthy lunch. Combine canned pumpkin with vegetable or chicken broth for a wonderfully easy-to-make soup. Add some chopped chives, basil, mint, or green onion and pepitas on top of a tablespoon of plain yogurt and you'll be recognized as a gourmet chef. If you want a creamed soup, add a can of fat-free condensed milk to the pumpkin and top the same way (with our without the yogurt. Pair the soups with a grilled turkey panini on whole grain bread (like that baked by Roman Meal and you have a complete lunch. You could even serve slices of pumpkin pie for dessert, and, I hope you'll invite me! Punkin Chunkin and Healthy Pie, nutritional benefits pumpkin pie, nutritional benefits pumpkin, mutritional benefits of pumpkin seeds, free nutrition content article, Healthy Aging Article, Healthy Living Article.